Today marks the 28th day of the government shutdown. It’s the longest shutdown in U.S. history and there are no signs that the White House and Congress are any closer to finding a solution. President Trump has insisted that any deal to reopen the government include $5.7 billion for a border wall. Congress has been unwilling to agree. And so, for now, parts of the government remain closed. ***Some investors have been wondering about the shutdown’s effect on the economy, and by extension, their portfolios. What’s the real impact? Before we address this, let’s be sensitive to the 800,000 workers directly affected by the government shutdown. The Washington Post reports that 14% make less than $50,000. Some are living paycheck to paycheck. Given this, missing even one paycheck (which has now happened) could mean major complications with paying rent, student loans, or monthly bills. Even those government workers with higher salaries still face increasing anxiety every day this shutdown continues. So before writing anything else, our thoughts go out to these individuals who are dealing with the stress and uncertainty of this ordeal. The impact on them is substantial. Let’s start with the nine federal agencies affected by the shutdown. Is that a lot? There’s disagreement, but a study from a few years ago puts the number somewhere between 60 and 430. That means “nine” is affecting between 2% – 15% of federal agencies. Certainly not a majority. Of course, the number of agencies doesn’t tell us much. After all, different agencies have different budgets. So, what’s the spending impact of the shutdown? The nine affected agencies account for roughly $325 billion of federal spending. For context, that’s only about 7% of total federal spending. Again, certainly not a majority. As to the 800,000 workers not receiving paychecks (and therefore not spending per usual), they only constitute half of 1% of all employees in the United States. UBS says history shows there hasn’t been much impact on stocks from past shutdowns. “Markets have actually historically performed positively when the government has been shut down. The U.S. government has shut down 14 times since 1980, yet the S&P 500 delivered positive returns two-thirds of those times, with an average return of 0.4%,” according to a UBS note. The shutdown hasn’t materially affected the economy, and the stock market, and therefore your portfolio — yet — but that’s not to say it won’t happen. As the shutdown continues, there’s a butterfly effect. Though 800,000 workers represent only half of 1% of all employees, when they don’t have salaries they can’t spend as much. That means the businesses once frequented by these works see fewer profits. These fewer profits curtail business spending … which then affects other, related businesses. There’s a ripple effect that spreads outward. When the government shuts down for only a few days, this ripple is unnoticeable. But if it lasts several months … Frankly, we don’t really know what may result because it’s never happened. “A longer shutdown is something we haven’t had. If we have an extended shutdown, I do think that would show up in the data pretty clearly,” said Federal Reserve Chairman Jerome Powell. On Tuesday, JP Morgan’s Jamie Dimon said, “Someone estimated that if it goes on for the whole quarter, it can reduce growth to zero.” According to Forbes, the government would have to be shut down for at least half of 2019 for GDP growth to shrink to zero. Of course, the situation doesn’t have to get that dire before it would rattle investors and send the markets down. But in all likelihood, our politicians would try to avoid that given their own re-election interests. In other words, regardless of the actual economic fallout of the shutdown, fear of its potential effects could be very damaging. To be fair, Neil was writing about investors’ beliefs relating to the market correction of last quarter. However, Neil’s point applies here too — if investors begin to believe the shutdown will negatively affect the stock market, the likelihood of that outcome happening intensifies. Famous investor and billionaire, George Soros calls this “reflexivity.” It’s the theory that there’s a two-way feedback loop between the markets and investors’ perception of those markets. In other words, investors don’t make decisions based on reality — but rather, on their perception of reality. Yet those actions go on to impact reality, which then affects investors’ perceptions even more. It’s a self-reinforcing feedback loop. So, whether or not the shutdown would actually hurt the stock market may not matter — if enough investors believe it would hurt, their actions may create the very reality they fear. With this in mind, where is investor sentiment right now? Right now, the biggest risk facing the market is risk. By that I mean that investors are lying awake at night wondering if all of the positive underpinnings of the economy and the markets are going away. ***So, what’s the right response to menacing headlines and lengthening shutdown? Focus on quality investments, not the financial media. … there are going to be distractions in 2019 that could derail the stock market. As we saw in 2018, the financial media loves to distract investors by blowing many external factors out of proportion. We could see that again in 2019. But no matter what the financial media throws at us, I believe our best defense remains a strong offense of fundamentally superior stocks. The press is going to focus on worst-case scenarios. That’s what they do. Our best response is to ignore them and focus on excellent fundamentals. Lululemon Athletica made news yesterday when it lifted its guidance for the fourth quarter of 2018, continuing a stream of good news for the athletic wear maker … This latest news reminds me why legendary investor Louis Navellier made LULU his pick in our 10 Best Stocks for 2019 contest. Louis’ subscribers are up 16% in Lululemon at the time of this writing. For more from Louis on how he identifies fundamentally superior stocks, click here. As to the shutdown, if you’ve been watching it with growing unease, ask yourself — have you been focusing on fear or fundamentals? 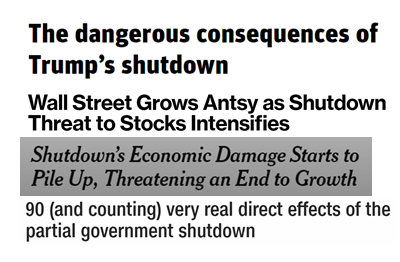 Article printed from InvestorPlace Media, https://investorplace.com/2019/01/the-shutdown-isnt-affecting-your-portfolio-yet-but-fear-may-change-that/.